Designed by architect Sergio Bernardes, it was inaugurated in 1972. The 288 square meter flag flies 330 feet high. 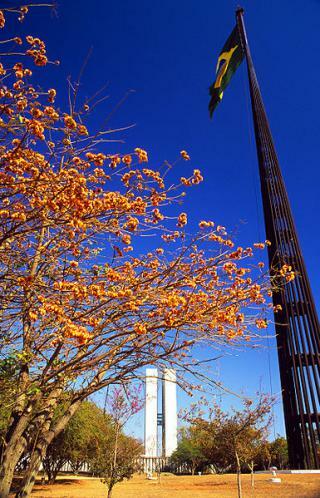 The mast, made of 24 poles (corresponding to the number of States at the time of its construction), is aligned with the National Congress and the the JK Memorial. The change of flag ceremony takes palce every first Sunday of the month and is carried out by the Army, the Navy and the Air Force – a patriotic spectacle not to be missed.